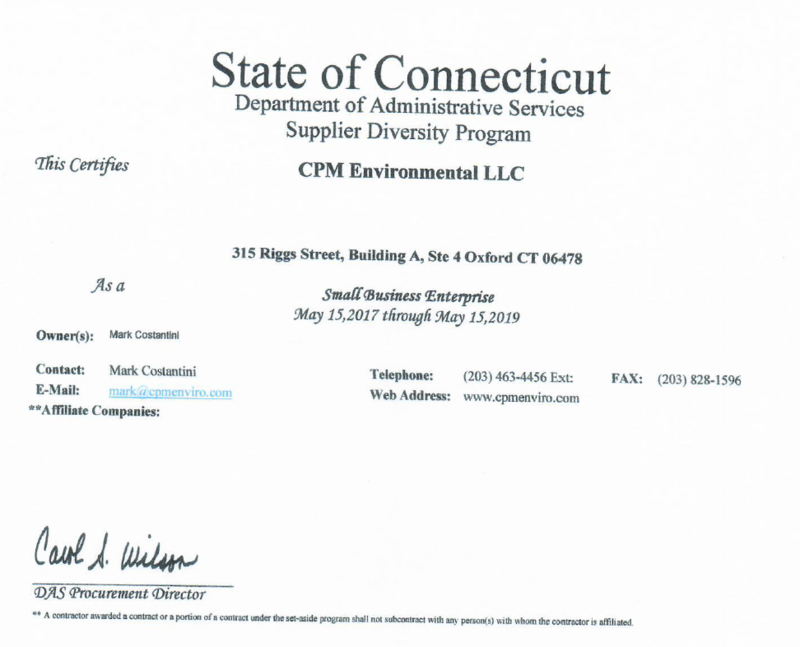 CPM Environmental LLC is a locally-owned and operated environmental company serving Connecticut. We specialize in asbestos abatement, lead abatement and mold remediation as well as demolition and renovation services for residential, commercial and industrial buildings. We are fully qualified to handle your environmental work from start to finish, and we have a proven track record of completing projects on schedule and within budget. Our knowledgeable, friendly technicians are here to answer any questions you may have. Together we can create a cleaner, greener future. We are the area's trusted environmental remediation experts in Ridgefield, New Canaan, Greenwich, Fairfield, Wilton, Trumbull, Westport, White Plains, Harrison, Mamaroneck, Rye, Eastchester, Scarsdale, Yonkers and surrounding areas. Get A FREE Lead Paint, Mold, or Asbestos Removal Estimate! Asbestos is a set of silicate minerals that used to be utilized by manufacturers and builders for their sound absorbent and heat-resistant qualities. However, we now know that the extended inhalation of asbestos fibers leads to serious illness, including malignant lung cancer. Though the use of this material has been restricted or banned, it lives on in older structures. CPM Environmental LLC is more than capable of handling the asbestos abatement process, which will eradicate the danger and make sure your home stays clean. If you’re worried about an asbestos presence in your home, it really is better to be safe than sorry. We can help you determine your threat level and walk you through the necessary removal steps! Inspection: Buildings constructed primarily during the mid to late 19th century should be tested and monitored for traces of asbestos. The inspection will reveal asbestos levels, which determine the next steps taken. Buildings should also be inspected prior to demolition to reduce further asbestos air infiltration. Removing and Minimizing Asbestos: If levels are high, asbestos-containing materials (ACMs) must be removed from the structure completely. Another possible process is an enclosure, in which asbestos is contained by an airtight structure to prevent further health threats. Encapsulation is the process in which contaminated materials are sealed. Monitoring: Enclosure and encapsulation require maintenance and monitoring to ensure complete safety. Levels of asbestos must be measured regularly. Mold is known for its ability to compromise structures because of persistent moisture and water damage. It also produces an astounding number of health symptoms, from headaches and nausea to chronic fatigue, rashes, and many more. It is common for people to suffer a variety of symptoms that seem unrelated, but can all be traced to mold issues upon further investigation! CPM Environmental LLC offers mold remediation and removal services to rid you of these problems, as well as mold prevention products. We have solutions that really work – unlike home remedies that have been disproven time and time again. We will uncover the extent of your mold problem and advise you on the proper proceedings! Along with our asbestos and mold remediation services, we can handle lead abatement and are EPA certified for this task. Lead lives in paints, stoneware, and vinyl, and can infiltrate your soil and air through erosion and dust particles. This is how people contract lead poisoning, and we want to stop it! Feel free to contact us with questions about these services and more! Get your free cost estimate today! Have asbestos, mold, or other indoor air quality concerns? Contact us today to schedule an inspection and free estimate. We service CT & Westchester County area, including Greenwich, New Canaan, Ridgefield, Westport, Fairfield, Wilton, Danbury, Southbury, Middlebury, Newtown and surrounding areas.